Our weekend was pretty low-key - something that has happened in like forever. We basically were at home the whole time except for soccer and groceries and a run for me later Sunday afternoon. Only Finley has tech training still and i t is still at 830am so I took her and 2 teammates and then hit up the Farmers Market while they practiced. We dropped the other girls home and then headed home where I stayed for the rest of the day. It was too cold to do anything fun outside so we had no choice but to hibernate. Greg and Finley did venture out for groceries Saturday afternoon but Penelope didn;t leave the house from the time she got home from school Friday until she went back on Monday morning. I don't know when that happened last. She didn't mind though, she wore sundresses and dreamed of summer and warmth while watching some weird show on her iPad. On Sunday, we had a lazy morning before Greg and Finley headed out to West Island College where Finley was playing in a in-house SWU soccer tourney. There was no viewing for parents since the gym was too small so Penelope and I stayed home. Greg peaked in during both of her games and said she played well. These games are all against U10 teams and are basically evaluations for the outdoor season even if SWU isn't calling it that. When they got up, I bundled up for a run outside. I don't like running in the afternoon but it was significantly warmer at 230 then at 930 that is for sure. Nothing else too exciting happened for the rest of that day which is why i combined these two posts - our weekend didn't need a post of its own hahaha. I am not complaining in the least about our slow weekend though - we have been so busy with soccer and birthday parties and tournaments and trips to Edmonton that it was so nice to be free for this weekend anyways haha. Hope your weekend was everything you wanted it to be. So I read this book for book club and I am one of those individuals who 100% judges a book by the cover and this cover did nothing for me. I was sure this book was going to be boring and that I probably wouldn't read it. But then one of the ladies in the book club posted about it and how much she could relate to it and so I decided to have a peek. And then I was hooked. I read this book in about 3 days and have a notebook full of notes of things I took away from it. This book has profoundly changed my life in a way that I didn't think possible. Alexandra Jamieson is truly amazing and I love her honesty and bluntness and supportive vibe in this book. She talks about our unhealthy relationship with food and our bodies and how we can change this. Food should make us feel good and happy but instead for a lot of us, it makes us feel fat, guilty, ashamed and a whole host of other bad feelings. If you are not one of these people, then congratulations that is amazing. And I mean that with no sarcasm either. 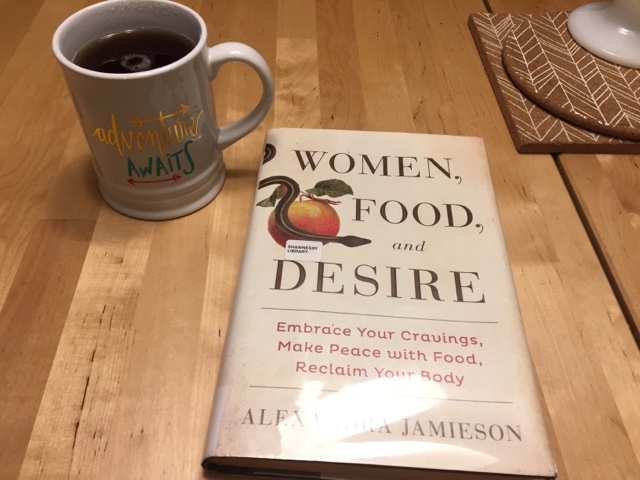 She wanted us to be mindful, intuitive eaters and making sure that we were eating good things for the right reasons not because we were craving something and using food to meet that craving even when it wasn't really food you were craving in the first place. She talked about all these migraines she was getting, always tired and so she went to a doctor who just gave her more drugs to take instead of dealing with why she was getting them. She was frustrated with this and went to a holistic doctor who said she had a overgrowth of yeast in her body causing all of these problems - and sugar was the main culprit. Our gut becomes overrun with sugar weeds and result in a digestive system that is knocked way out of balance. She went on to list all the symptoms that are from an overgrowth of yeast, also known as candida albicans, and I had almost every single one. And as I read this book, I had been dealing with headaches/migraines for about 6 days straight and it got me thinking. Thinking a lot. I thought back to when my migraines + sinus infections got worse, to when I wasn't able to eat dairy anymore, to when I didn't get bladder infections that lasted forever and when I started getting yeast infections and it was all right around I became a surrogate for my best friend. It made me wonder if all of the drugs and hormones I had to take messed with the good bacteria in my gut and that my steady stream of sugary teas, chocolate milk and starbucks and all other kinds of sugary crap just kept feeding it. 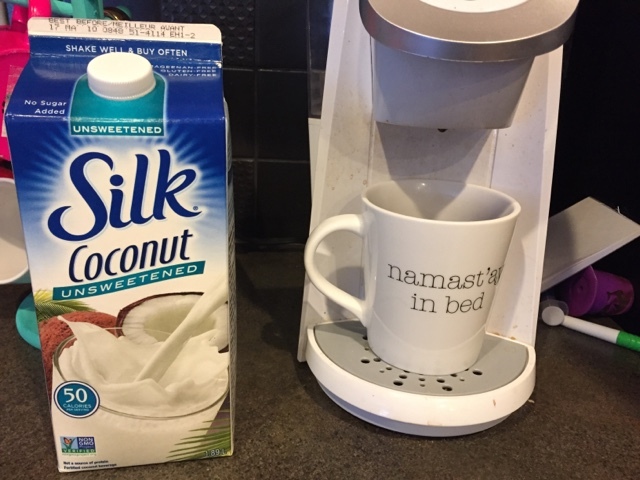 In the last year or so, I had tried cutting back and while I have gone through long phases of not drinking Starbucks, I was just supplementing that habit with sugary earl greys and copious amounts of chocolate milk at home. So this time, I knew it had to be drastic and I had to do it cold turkey and cut all the sugar out at once. 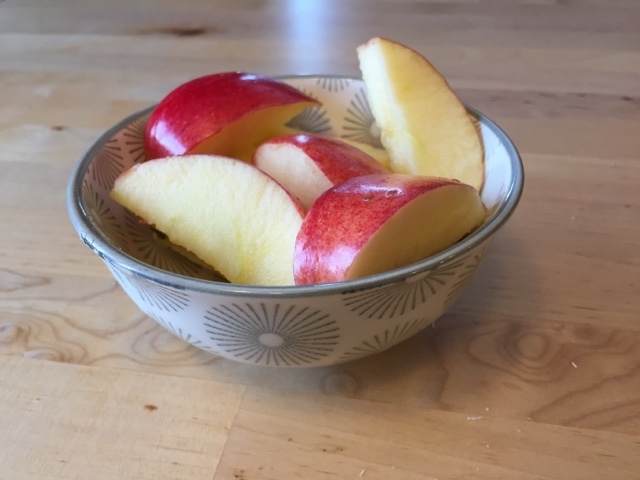 As I talked to Greg about this, he supported me 100% and I knew that he would, but he told me to not focus on the minimal amounts of sugar that would be in my tablespoon of salad dressing or the brown sugar in my homemade drumstick sauce. That wasn't my problem. He told me to focus on drinking my tea without any sugar, no trips to starbucks, no buying of chocolate bars in line at grocery stores, no buying a 2L jug of chocolate milk and finishing it off in one day. The rest of my eating habits are very good which is a good thing. I just needed to get my liquid calories under control. I was at the point where all the headaches, stomach aches and everything else was just too much and I really needed to stop and revamp my diet and this book helped me figure all that out. Monday was a pretty easy day since my body didn't know it was going through a sugar detox at the time. When I picked up the girls from school and we were walking home in the cold I would have sold my soul for a sugary delicious tea but I had a nap instead and then woke up and made supper so it was ok. Tuesday though, OMG, I thought I might die. It was so hard. I woke up with a headache that lasted until about lunch time. I ended up running outside in the afternoon before I picked up the girls from school because I needed something to distract me from the sugar I couldn't have. Wednesday and Thursday I woke up with headaches and napped a lot because I felt so tired and had no energy. I did get a treadmill run in on Thursday but it was kinda brutal and I hated the world every second of it. Friday was a huge challenge since I had bootcamp first thing in the morning and I was a little worried since I typically have a headache until lunch time but it was ok. I survived - barely - there were times where I thought I was going to pass out because I felt so weak and energy-less. The rest of Friday was pretty awful - wicked headaches and sugar cravings and a lot of doing absolutely nothing but lay on my couch and drink sugarless tea, which surprisingly wasn't too bad. Saturday I felt pretty great and I woke up without a headache and didn't have one that whole day. Finley made white chocolate mousse for dessert and I had one teaspoon and then Penelope ate it the next day. Sunday was another day without a headache so I am feeling optimistic although I still need to figure out how to healthily add energy back into life or I might die haha. Any suggestions are most welcomed. Although I did realize that I cut out all these liquid calories and noticed that my water consumption was wayyyyy down this week which clearly contributes to headache, tiredness and lack of energy so my goal this week is to really focus and make sure I get at a minimum, 80oz of water each day. 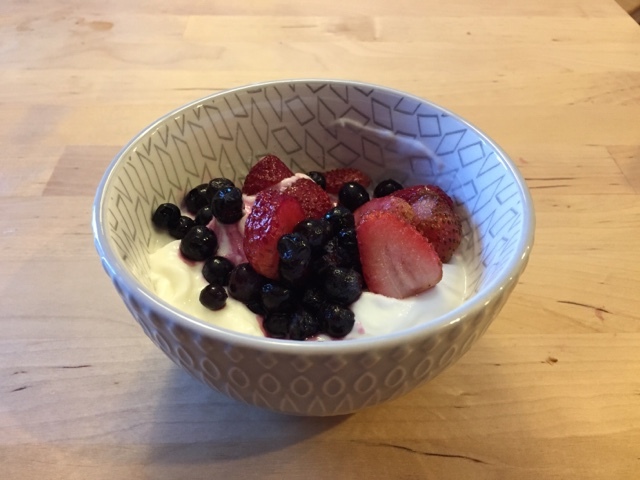 I switched from my regular coconut flavoured yogurt which had a ton of sugar in it to plain greek yogurt, a tiny bit of stevia and some fruit. Fresh berries are expensive right now and I have a frugal husband who does our groceries so I compromised with frozen wild blueberries and strawberries that have no sugar added so there is no syrup and only the natural sugars found in the fruit itself. I eat this usually every other day because I don't love the greek yogurt as much as I loved my coconut yogurt so it's been a bit of a struggle but I am getting there. I eat apples every day, sometimes 2x a day. I cut them up and eat them plain and they are the greatest thing ever. I switched from sweetened coconut milk to unsweetened and I didn't even know that I did it. Greg was too busy last weekend to get groceries so I created an order on the Superstore App and did the Click and Collect to pick them up. I added the unsweetened because I thought that was what I always drank. I added it to my cereal once my other container was finished and thought there was a difference in taste but I couldn't figure out what it was until Greg asked me Sunday morning what I thought about the unsweetened coconut milk and I was like what do you mean, don't I always have that and he said he usually gets me sweetened. I mean it's definitely not as good as the sweetened stuff but it's definitely tolerable and I don't see any need to switch back to the sweetened version again, which is a good thing. I tried adding it to my tea but I just couldn't drink it, which is weird since my Starbucks drink is basically all chai and soy milk but it was a no go. I dumped it down the sink. I tried using honey that I purchased from the Calgary Farmers Market, pure maple syrup and agave syrup that I found in my pantry. They were all awful. Greg suggested using stevia and so I did some research and stevia doesn't feed candida so it was safe for me. It has no calories and doesn't affect blood sugar, and it contains anti fungal and antibiotic properties. I also heard it was sweeter then real sugar so needed less. I excitedly went and bought some at Sobeys and came home and put my favourite tea in the keurig and added the package of stevia. It was not great, I was disappointed. I tried it another tea and it was ok. I bought 3 new kinds of tea and tried the samples I got from Greg's cousin and what I have discovered is that the teas I don't associate with sugar and being sweet are really good, or at least somewhat enjoyable but when it comes to a tea that I have loved previously full of sugar I can't drink without gagging and dying a little inside. I am really happy that I figured that out. I feel a lot better stomach wise but I still have a long ways to go. I don't want to ever not enjoy a cupcake or homemade dessert but I have to beat the addiction first. I did this about 5 years ago with coke. I was drinking coke everyday and it was seriously destroying my stomach so bad so I quit. It was a really hard 2 weeks and then I was ok and quit craving it but I didn't touch any pop for about 8 months and when I did have one, i was able to have just one and not want more. Now I only ever have pop when camping or out for dinner occasionally or at a movie theatre and I am fine to never have another one for another 6 months or whatever. I beat that addiction and learned how to do it in moderation and I know that this will be the case this time too.